You said you're going to update my new Office 365 account with my email from the old GoDaddy account. What do you mean by that? Your new Office 365 mailbox is created. Your mail will be moved over to Office 365. Then your MX records will be updated to start routing all new mail to Office 365. Once the MX records are pointing to the right place, we make sure all of your new email is going to your Office 365 account and an email will be sent letting you know that your Office 365 account is ready to go! For more information about MX records, see What is an MX record? How long will it take to move my email? Results will vary by mailbox size, but the upgrade should complete within 48 hours. However, you can still use your GoDaddy email during the upgrade process without interruption. 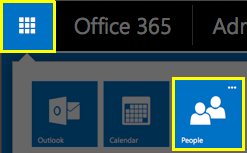 How do I access my new Office 365 account? What do I do now that I'm in OWA? It looks so different from my old email. You mentioned my email, what about my contacts and calendar items? All your old email will be moved to your new account, along with everything that comes in in the future. Your contacts and calendar will not be moved over automatically but there is a straightforward way to move contacts, outlined below. How do I export my contacts from my GoDaddy email? First, you'll need to export your address book from Workspace Email. Then, you'll need to import the CSV into OWA. From the app launcher, select People. From the Settings menu, select Options. In the People section on the left, click Import your contacts. Locate the CSV file you exported from Workspace Email, and then click Import. What happens to my calendar events? Will I lose access to my GoDaddy email as soon as I begin the upgrade to Office 365? No. Your GoDaddy email account will be available until you cancel the account or fail to renew it. 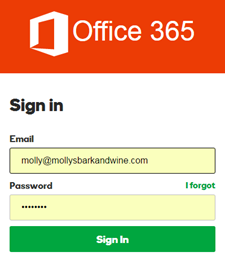 Note: If you are using the same username on both Office 365 and your old GoDaddy account, the password you provided when setting up Office 365 is automatically applied to your existing GoDaddy email account. What about my other GoDaddy applications such as Calendar, Online Storage and Fax Thru Email? GoDaddy Calendar, Online Storage and Fax Thru Email will still remain active once you upgrade to Office 365. Note: If you are using the same username on both Office 365 and your old GoDaddy account, the password you provided when setting up Office 365 is automatically applied to your existing GoDaddy calendar, storage and Fax Thru Email applications. Will my customers still be able to contact me via email during the upgrade process and after it is complete? Yes! During the upgrade process, you can continue using your GoDaddy email without interruption. Once you receive an email notifying you that your upgrade is complete, your new messages will begin flowing into your new Office 365 account. What happens when I go into the WCC and try to use an email credit on a migrated domain? Using email credits on a migrated domain is currently unavailable. The WCC prevents customers from setting up an email credit on a domain that has been migrated. Is that it? Am I all set to use my new Office 365 email account? What about my old email account? You're all set with your new account. Note: Once your upgrade is complete, you will need to cancel your old GoDaddy email account. To Cancel Your Old GoDaddy Email Account. Click the Plus Symbol (+) to expand the email section. Click Options, and then click Cancel this Account. If you would like to request a refund for the remaining time / credit on your old GoDaddy email account, please contact customer support.